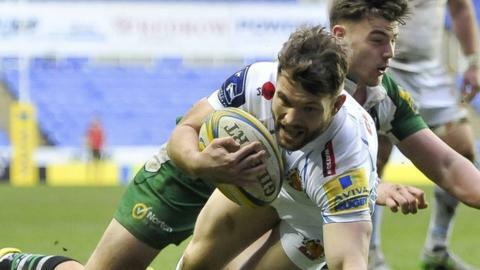 London Irish slipped five points adrift at the foot of the Premiership as second-placed Exeter battled back to win at the Madejski Stadium. Exiles flanker Ofisa Treviranus grabbed the only try of the first half as London Irish led 7-6, with Gareth Steenson responding with two penalties. London Irish's Theo Brophy Clews and Steenson traded penalties before Dave Lewis's try put the visitors ahead. Two Steenson kicks put the game out of Irish's reach, despite Topsy Ojo's try. London Irish, who did enough to secure a losing bonus point, were the only side in the bottom three to lose this weekend, with Newcastle Falcons overcoming Northampton 26-25 to move up to 10th after Worcester Warriors ended a 13-game winless run to boost their survival hopes on Saturday. Victory was Exeter's first in three league games, moving them to within four points of leaders Saracens. There was a minute's silence before kick off in Berkshire in memory of former London Irish chairman and player David Fitzgerald, who passed away aged 55 following a battle with cancer. Treviranus gave the hosts the lead inside 10 minutes, linking up with Ojo after the winger burst through the middle and dished off a pass under pressure. Irish, with the worst defensive record in the top flight, frustrated Exeter for long periods, limiting the Devon club to two first-half penalties, despite being a man down before the break following David Paice's sin-binning. Teenager Brophy Clews, making his first Premiership start for London Irish, edged the lead back out to four after the interval but Steenson hit back immediately from the tee. Exeter looked more menacing after the break, Olly Woodburn threatening after intercepting a pass, while the visiting pack asserted itself against an overworked side, but it was not until replacement scrum-half Lewis threw a dummy to scamper over that the Chiefs went ahead. A second yellow card, this time for Ian Nagle, who had replaced injured captain Matt Symons in the first half, allowed Steenson to kick the margin out to nine points. And while Ojo raced away for a near length-of-the-field try with 18 minutes remaining, Exeter did not allow the hosts any more hope of a comeback, with Steenson adding a fifth penalty to complete the win. "I was pretty gutted today. We started so well and we had the attitude that I thought would be good enough to beat Exeter. "We had it for long periods of time and I think the changing room reflects that disappointment in the result. But the effort I thought was pretty good today. "Not being able to take vital opportunities was probably key in the end. "The players make enough mistakes and referees are entitled to make a few as well. That's human nature. "When things aren't going your way and you're under the cosh, most of those fifty-fifty things will go against you." Exeter head coach Rob Baxter: "We found a win with our driving game and scrum coming through in the end. "We battled as there's no team in the Premiership which rolls over. "We squeezed them but it gets tougher and tougher and you need to pick up points all the time to remain in the top four." London Irish: Fenby; Ojo, Mulchrone, Williams, Hearn; Brophy Clews, Steele; Smallbone, Paice, Aulika, Symons, Stooke, Treviranus, Narraway (capt), McCusker. Replacements: Ellis, Tom Court, Halavatau, Nagle, Trayfoot, Allinson, Geraghty, Lewis-Pratt. Exeter: Dollman; Woodburn, Whitten, Hill, Short; Steenson, Chudley; Moon, Yeandle (capt), Low, Hill, Parling, Armand, Salvi, Waldrom. Replacements: Cowan-Dickie, Hepburn, Francis, Atkins, Horstmann, Lewis, Hooley, Campagnaro.